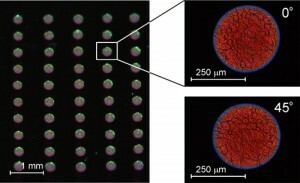 The team from the Department of Engineering have created a unique way of printing organic lasers using everyday inkjet technology. This allows lasers to be printed in well-defined locations, either individually or in arrays, and with the same or different wavelengths. The invention can be thought of as a “laser ink” which can be used to form images at resolutions of up to 300-600dpi. A laser is a pure “coherent” form of light, occupying a very narrow wavelength range. Laser devices are ubiquitous in modern life, from Blu-ray and DVD drives, to equipment for medical sensing and treatment. Most lasers are made on silicon wafers using techniques similar to those that are used to make microprocessors. These are relatively expensive techniques that work best when large volumes are to be manufactured. The printable lasers are made from chiral nematic liquid crystals, similar to the materials used in flat-panel LCD displays. They are a unique class of photonics materials that can be stimulated to produce a laser emission. This relies on the correct alignment of the helical structure of the molecules, to allow them to act as an optically resonant cavity. The team has previously used these materials in liquid crystal displays to create low-cost tuneable lasers [see i-Teams Easter 2012], and has now used their expertise to create a method to print them onto any substrate. The resulting printed laser or laser array works by being illuminated by an external coherent light source (an optically-pumped laser), and by varying the exact components of the laser ink the printed lasers can generate a wide range of wavelengths from near ultra-violet through to infra-red. There are two questions for the i-Team: firstly, what are the best applications for this type of laser – for example, laser displays, “lab on chip” bio assays, sensing, smart surfaces or something else entirely? Secondly, having identified the best target markets, how should the technology best be packaged to create a viable long-term business model?